We just received this beautiful "Tall Cloud Rift Vase" by Colin Schleeh. 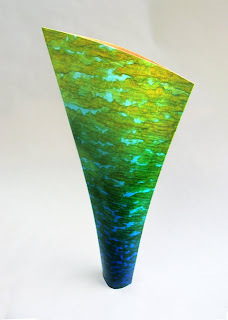 It's a functional vase (28" h x 12" w) made of birch, which Colin has painted in rich blues and greens. Available for under $2000. Great for a mantle, side table or as a wedding gift. We will occasionally post updates on new artworks and artists that we are featuring here in our gallery -- as well as other exciting projects that we are involved with. This blog will not accept public comments, but we encourage and welcome your comments via email at lattitudegallery@yahoo.com.